Florafelt Vertical Garden by Duviv Gardens, San Francisco. Florafelt Vertical Garden Planters come with hanging tabs located at the top corners. You can simply hang them on hooks or even deck screws, nails, or use zip ties. 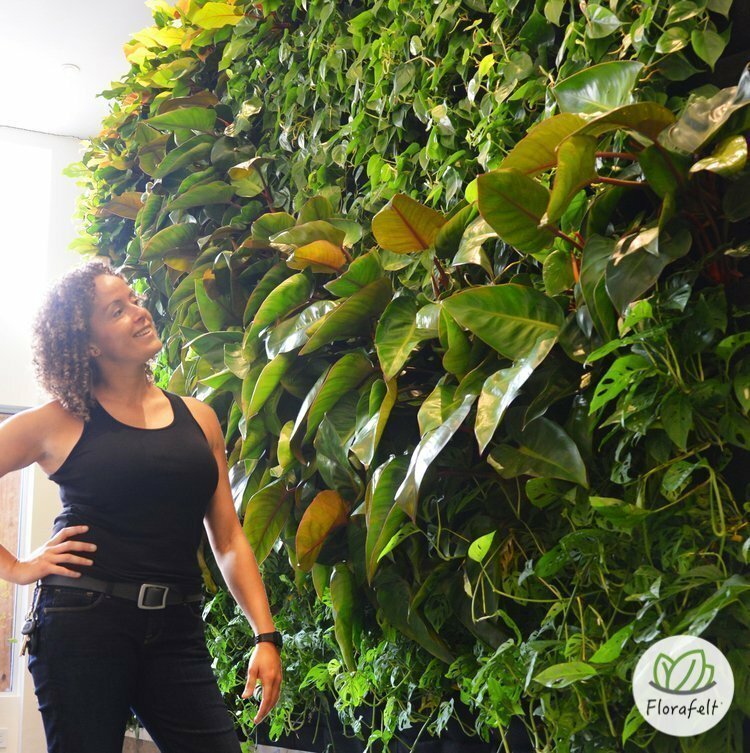 Larger vertical gardens can be created by creating a grid of hooks spaced at 32 inches horizontally and 24 inches vertically. The panels can then be overlapped to create a continuous planting surface. Florafelt panels can be hand watered with a hose outdoors. This works great with succulents that like to go dry. Or you can add an irrigation drip line at the top and let extra water drip from the bottom. A gutter can be placed at the bottom to direct water to a nearby drain. Florafelt Vertical Garden Planter Hanging Tabs. Use the mounting tabs to simply hang from hooks. A grid of hooks on the wall is a simple way to mount Florafelt Vertical Garden Planters to a wall. Hooks are screwed into framing or a solid wall to create a regular grid. Planters are then shingled on the wall by hanging them by their nylon mounting tabs. The air gap keeps the back dry, while the planters shingle down so that the water drips into the lower felt. Simply water the top row only and the liquid will spread evenly down the wall. It’s an ideal method for outdoors – on fences and walls where water is not an issue. For extra safety indoors, use rubber pond liner on the wall. Be sensible. Consult with a licensed architect for structural advice for a large installation and when you are concerned about moisture sensitive areas. Stuff pockets with Root-Wrapped plants to create your living design. Plants will grow out a foot or more, and eventually the felt pockets will simply disappear behind your living wall. 1. Choose a rigid backing like masonry wall, wood fence, or plywood facing. 2. Waterproofing is not necessary for exterior rated surfaces. However, for interior surfaces glue a rubber EDPM pond liner to the wall first. 3. Measure and mark a grid pattern spaced 32 inches across and 24 inches high for each Florafelt 12-Pocket planter. 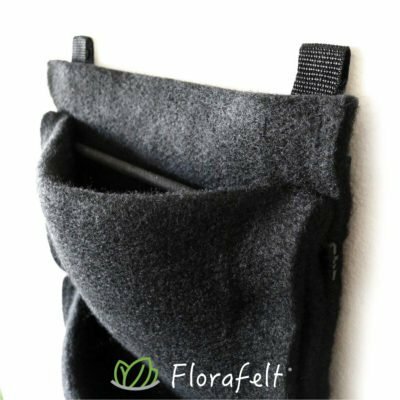 You can vary the width using the Florafelt 4-Pocket planters, which are 12” wide. 4. Install sturdy hooks on the grid marks. If needed, use rubberized sealant where the hook penetrates the rubber membrane. 5. Use the nylon tabs on the top of the Florafelt planters to create the shingle pattern. Adjacent planters can share the hook. 6. Install a drip line in the top row of pockets only. Water will slowly drip down and wick evenly throughout. Connect to an automatic watering timer that runs 30 minutes, twice daily. Adjust as needed. 7. Excess water will drip from the bottom, which can water a planter below or be directed, using a rain gutter, to a nearby drain or collection tank to recirculate. 8. (Optional) Build a frame to finish the edges. Leave pond liner long at the edges to make the edges watertight too. Bend up and trim at the frame’s front edge.